"Iranophobia," an irrational fear of all things Iranian, has become the Islamic regime's catch-all excuse for international criticism. Groups like the Organization of the Islamic Cooperation (OIC), the representative body of the world's Muslim nations, are pushing for a United Nations resolution to ban denigration of Islam and other religions. But hate towards Jews remains a key part of political speech and culture throughout Islamic countries, even those touched by the Arab Spring. A "Million Man March against the Judaization of Jerusalem," organized by Egyptian-American Imam Salah Sultan, is planned for Monday in downtown Cairo. Sultan, a former Columbus, Ohio imam who is the rapporteur of the Jerusalem Committee of the International Union of Muslim Scholars, said that his organization would soon issue a fatwa "permitting the blood of Zionists." He also stated that "there is no excuse for anyone to refrain from Jihad after God has removed the affliction, which obstructed us from jihad to liberate Palestine." Attaching the epithet of "Jew" or "Zionist" to hated leaders has been common of late, such as former Libyan dictator Muammar Gaddafi and current Syrian President Bashar al-Assad. It is meant to portray repression as a Jewish theme. Old anti-Semitic libels and conspiracy theories are also combined with hate of Israel, to attempt to legitimize these attitudes. Several recent examples from the Middle East Media Research Institute [MEMRI] highlight how this hate finds expression in popular political discourse. These examples serve as the tip of the iceberg, showing that even in countries without a significant Jewish population, anti-Semitism is rampant. 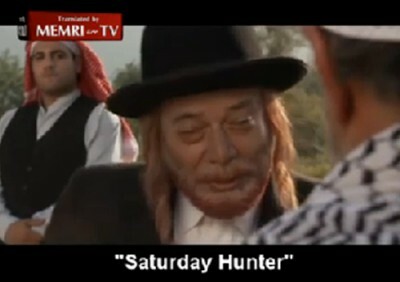 "Saturday Hunter," a virulently anti-Semitic film, is a recent hit in the conservative Islamic Republic of Iran. The story revolves around a boy who goes to live with his religious Jewish grandfather, who is a rabbi, after his Jewish mother marries a Christian. The grotesque imagery of the film portrays religious Jews as murderers fighting a war against "infidels," as the rabbi tries to brainwash his grandson into participating in the killing. He urges the boy not "to betray the Jews" and to "never reveal your inner thoughts to anyone," as he tries to build a "war machine to take over the world." Managing Director Mohsen Sadeqi argues that his film is simply anti-Zionist, and that it is wildly popular with Iranian audiences. "It is natural that the Zionists are angry about the film screening which make us more strong-willed," he told the Tehran Times. But in response to protest letters sent by Iran's Jewish community to the government, which went unanswered, Sadeqi responded by saying that "Judaism is a symbol of evil" and that "movies like these will continue and will be filmed in the future." Syrian writer Osama al-Malouhi blends classic anti-Semitic lies with current events in an Oct. 26 article entitled "Syrian Blood for Matzas," specifically how the Jews love the oppression of the Arab Spring protests. The piece was posted to the website Sooryoon.net, a popular network of Islamists opposed to the embattled regime of President Bashar al-Assad. In his article, Al-Malouhi claims that 80 percent of Israelis support Assad, which is why the world will not stop his crackdown on civilian protests. He then repeats false claims that Jews "are taking pleasure in watching Syrian blood being spilled. Perhaps the murderer [Assad] will [even] bring it to them for [their] matza," he writes, in a reference to the ancient blood libel that Jews bake human blood into their Passover food. "Asking myself why Jewish support of Bashar increased [even] after they saw the rivers of Syrian blood this mass-murderer spilled in Syrian towns, an old image leapt to my mind, of Jews bleeding people and using their blood to prepare matzas," Al-Malhouhi adds. "Logic does not accept this, but the facts prove it." The same hate is evident in an article for Kuwaiti daily al-Watan, written by journalist Abdullah Khallaf. Former Libyan dictator Muammar Gaddafi was actually a Jew, who was empowered as part of a Jewish conspiracy, Khallaf claims. Zionist agents contacted Gaddafi while he was studying in London and pushed him to join a Jewish conspiracy to take over the world and to exploit Libya in particular. "The violence with which he destroyed and killed tens of thousands, and the bombing of the [Libyan] people during his last revolution, indicate that he internalized the directives of The Protocols of the Elders of Zion," Khallaf declared, trying to connect Gaddafi to a discredited anti-Semitic forgery. Gaddafi was also protected by "Jewesses," a reference to his multiethnic female guard, and "wasted funds" according to supposed "Zionist" directives. Lebanese columnist Bushra Gharz Al-Din invokes the Protocols to argue the exact opposite for local daily Al-Diyar. The Arab Spring is actually a Jewish conspiracy to take over the world, Al-Din writes, as prescribed in the Protocols. "About 100 years ago, 300 of the most arrogant elders of Zion convened. [They were] members of 50 Jewish groups who held secret meetings at which they plotted how to enslave the world," Al-Din writes. "[They instigated] revolution after revolution, in Tunisia, Egypt, Libya, Bahrain, Yemen and Syria, and what is yet to come will be even worse… After all this, the only question left to ask is: How long will we continue to let them [the Jews] toy with us, like puppets on hidden strings?" Adolph Hitler's anti-Semitic fantasies are also popularly cited. In September, Saudi columnist Khaled Al-Ghanami echoed accusations of Jewish conspiracies for a column in local daily Okaz, which has a circulation of several hundred thousand in the conservative kingdom. As proof for his conspiracy piece, "Liberalism – A Jewish Deception," Al-Ghanami cites Hitler's Mein Kampf. "[Mein Kampf] contains many stories about the Jew who lurks in the shadows (according to Hitler), and whose calls for freedom and equality are nothing but diabolical plots aimed at weakening the state, causing anarchy, undermining security, and controlling the fate of the nations," al-Ghanami writes. "This is because the Jew believes he is superior to others, and he dislikes manual labor, preferring to make the people his slaves by [giving them] interest-bearing loans." Even where journalists try to distinguish between Jews and Zionists, anti-Zionism is often tinged with hateful rhetoric. In another MEMRI translated article from Qatar's Al-Arab, Egyptian journalist Sharif Abd al-Ghani laments the popular custom of cursing Jews during Friday sermons. Despite admonishing common anti-Jewish attitudes in religious education and the Arab world's mosques, Abd al-Ghani also states that local people believe that their curses have "fulfilled their role in the struggle against the Zionist enemy in the best way possible." Even his positive examples of Jewish scholarship and invention appear to come from a 2006 Pakistani article entitled "Why Are Jews So Powerful?" Examples of anti-Semitism in Arab media, such as the few mentioned above, remain rich in their conspiracies and varied in their accusations. They also match extremely low levels of positive feelings towards Jews, as shown in Pew opinion polls. Ultimately, the common denominator is that increasing freedom hasn't killed anti-Semitism, and that the Arab world's trend of hate continues to find new ways to express itself. If it is only "against Zionism", then why is the "Rabbi" dressed Chareidi? The Rabbi in the picture looks Chareidi, not Religious Zionist. This is a pattern, in everything from anti-semitic caricatures that show decidedly non-Zionist (or anti-Zionist) Jews, to actually blowing up Chareidi children (for example, a bombing in Meah Shearim). It makes it obvious that they really mean "Jew". As a Chareidi myself, I suppose I should consider it a compliment..
Movie portrays the jewish grandfather behaving as muslims do !!! LMAO @Sandy Kramer, that is exactly what I thought. The way the father tries to 'radicalize' the grandson, and not to 'betray the jews'. Funny thing about muslims, they do not have a sense of irony and hypocrisy bothers them not a bit. Amazing. If you were to substitute "Islamicist" for "Jew" in the movie "Staurday Hunter," you would have a powerful and true documentary.